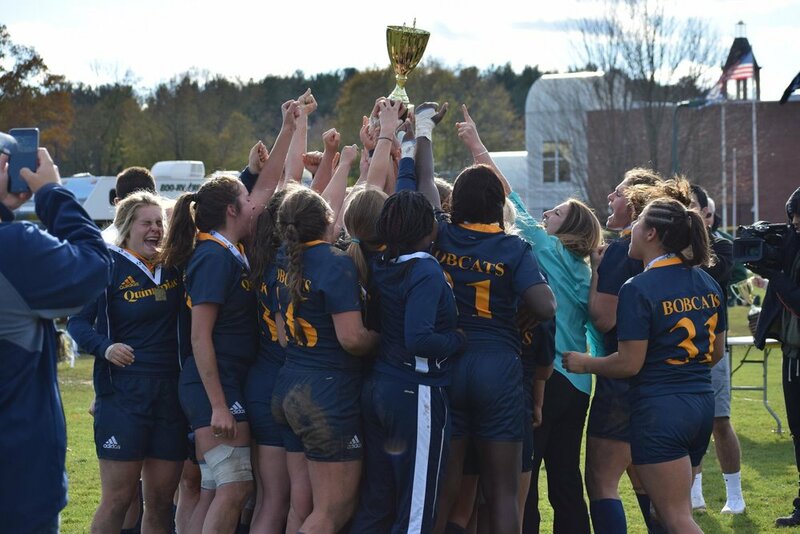 On Thursday, December 1, 2016, Quinnipiac women’s rugby players were celebrating their second consecutive national title in the cafeteria of Quinnipiac’s main campus. Joy filled the room-they had done it again with a victory over Central Washington to bring the title back to Hamden. Everything was good, except for one thing: John Lahey, current president of Quinnipiac, was nowhere to be seen. President Lahey’s office could not be reached for comment. Hillary Haldane, an anthropology professor with a focus in gender studies, echoed this same sentiment. "All the things that women do and get no credit for, it's no different with sports. You hold up and value what the people in power hold up and value,” said Haldane. “The fact that our president goes to the men’s games and doesn’t go to the women’s games is appalling. Your job as the president his to simply act like you care about something." Other female athletes say they feel the same way – regardless of success or accomplishment, the lack of recognition for women’s athletics at Quinnipiac will continue. Despite the victories and consistent success inequality prevails when it comes to women’s athletics at Quinnipiac. There is an argument to be made that women’s rugby is the most successful sport at the school. However, the exposure the team gets and the following it attracts do not reflect that. What Schussler is saying is that although the women’s rugby team is more successful than most sports here, it does not get the coverage that the others do. Lack of recognition and support for women’s athletics is not limited to Quinnipiac, it also extends to the rest of the NCAA. This inequality stems in part from a lack of opportunity to compete in the first place. Without the opportunity to play, a lot of these women athletes do not even get the chance to earn support. 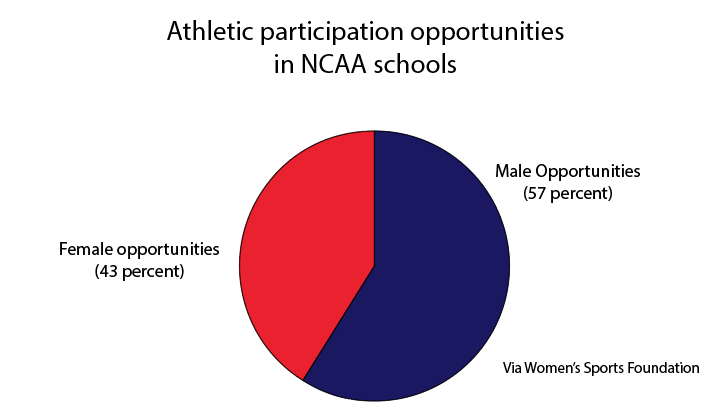 “Even though female students comprise 57 percent of college student populations, female athletes received only 43 percent of participation opportunities at NCAA schools which is 63,241 fewer participation opportunities than their male counterparts,” according to an NCAA publication cited by the Women’s Sports Foundation from 2014. Even with Title IX in place, there is still a vast discrepancy in the opportunities that men get in sports in comparison to women. And even when women get the opportunity to play, the amount of financial aid granted to men and women athletes remains unequal. 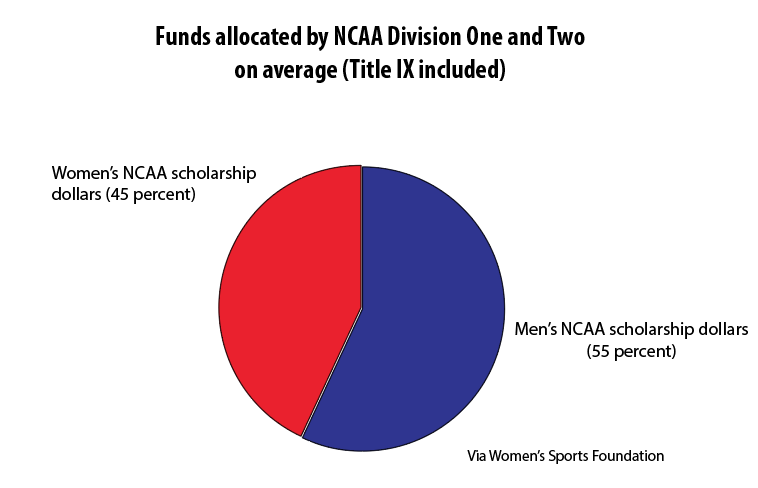 “Although the gap has narrowed, male athletes still receive 55 percent of NCAA college athletic scholarship dollars (Divisions I and II), leaving only 45 percent allocated to women,” the 2014 NCAA publication stated. Title IX implies that men’s and women’s athletics will receive the same opportunities both financially and substantially. That is not what the report reveals. According to Attorney Felice Duffy, a New Haven attorney specializing in title 9 suits, it is not uncommon for schools to not fully comply with Title IX. “I don’t think any school has ever had to fully comply with what Title IX needs, they just come up with some type of settlement. I mean, you’re familiar with the situation at [Quinnipiac],” said Duffy. Differences in finances for men’s and women’s sports, Title IX or not, have always been a problem. “There is no clause in Title IX that says ‘except if one gender generates more revenue than the other,’” Andrew Zimbalist pointed out in a 2016 New York Times article. A very good example of gender disparities in athletics is a comparison of the University Of Connecticut men’s and women’s basketball programs. The women’s basketball program at UCONN is one of the best, if not the best, women’s basketball team ever, winning four consecutive national titles from 2013 to 2016 and 11 altogether. The women’s program also owns the two longest win streaks, irrespective of gender, in college basketball history. The men’s program has won four national titles total in its existence. Nevertheless, the men’s team still attracts about 2,000 more fans than the women’s program to every home game. In the 2014-2015 season, the UCONN men’s basketball program averaged 10,687 fans at every home game. The women, on the other hand, averaged 8,216 fans per home game. All together, in the 2016-2017 season, NCAA Division One women’s basketball had an average attendance of 1,538 per home game. NCAA Division One men’s basketball had an average of 4,633 fans in attendance per home game. The disparity is not lost on women athletes. “It is obvious that there is a big difference in attendance between men’s and women’s sporting events,” said Mackenzie Merkel, a senior on the women’s track and field team at Quinnipiac. Haldane compared the difference in interest in men’s and women’s athletics to the attitude of the restaurant industry. “I look at sports as no different. Women are good and competent.. can make a mean stew, but it doesn’t come out of that five-star restaurant,” Haldane said. Though the difference in attendance is glaring, the female athletes here have learned to focus on the task at hand rather than dwell on the negatives. Attorney Duffy believes that no matter how much we worry about attendance or financial attention, the problem is deeper with women’s athletics. “All these things you’re talking about, we don’t pay as much attention, we don’t need a new stadium because of lack of attendance, is all putting the cart before the horse because if they actually supported them the way they supported men’s, it would change the culture and people would look at them the same way,” Duffy said. This inequality is a problem that players say still bugs them. But some players say that hope is on the horizon for their beloved sport and women’s athletics in general. Even locally the support has picked up, with someone noticing this billboard on 91 this past November. Haldane believes that journalism is a great starting point to attack this problem. Women athletes are waiting not only for steady attendance, but also the attention and support from their school that they think they deserve. Incremental growth in both attendance and support is key for women’s athletics at Quinnipiac, according to women’s athletes and coaches. It is on it’s way, but just at it’s own pace.